Have you ever monitor your server cpu load in real-time? This plugin is the answer. No need to login your Cpanel server, No need to check Dashboard Admin for Server Load. 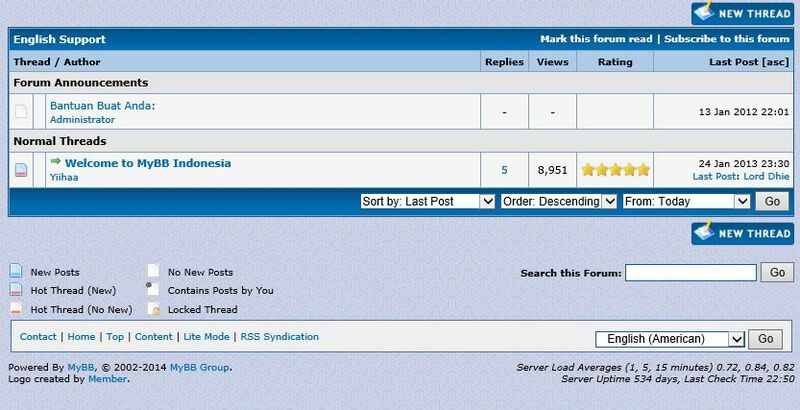 This server resources view can see at any pages of your forum! - edit and set Line 51, for CPU Load trigger warning. Tips: for easy setting, monitor your server load via Dashboard Admin at peak time as reference (eg.10AM - 2PM or 6PM - 9PM). if you're un-sure of this setting, make it higher than 5, to turn-off Email Alert. As MyBB recommend value 5.0 for normal *NIX Load Limiting. But, some high-end shared-webhosting server stil running well on big CPU Load. Some code, you have to change email address to your mail. This plugin allows you to print out the status of a minecraft server. This plugin allows you to load some custom templates so they can be used without core edit.